Most of the mushrooms on my Mycological Bucket List remain elusive. But Microglossum viride showed up last summer when least expected. My wife and I were perched precariously on a moss-covered hillside, taking photos of black trumpets and charismatic clumps of Amanita flavoconia, when we noticed the little green clubs emerging from the moss. They were small enough and, in the moss, green-on-green enough, that we would not have seen them from a distance, or even from the standing position. Mycologist Tom Volk once told me that, at the closed Gates of Heaven, bad mycologists are forced to revisit their woodland trips and are shown the many incredible mushrooms they missed, just a few feet away. 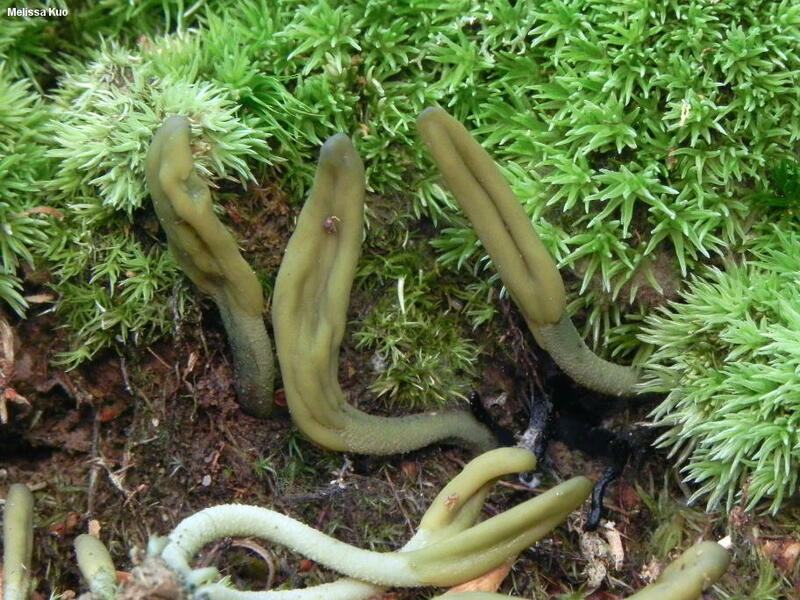 I wonder how many times I have stood in a patch of moss near Microglossum viride and missed it! If you can manage to spot it, Microglossum viride is pretty unmistakeable (at least, in North America; see the comments below for a European look-alike). It's green from top to bottom, and its little, partly-flattened head often develops a longitudinal crease in the middle. 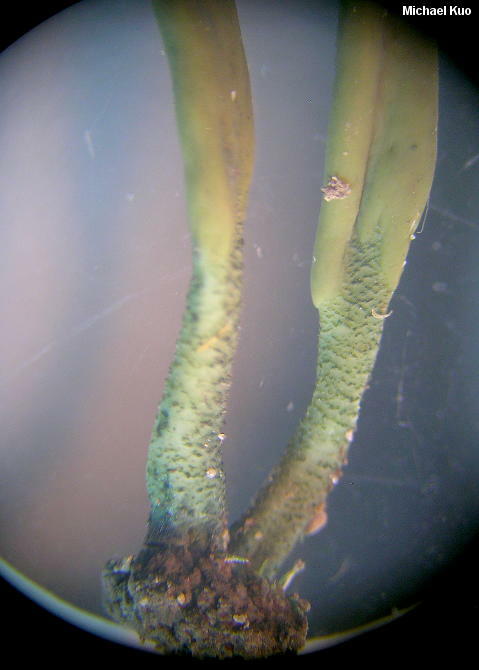 The surface of the head is smooth, but the stem surface is finely scaly with tufts of flocculence. Microglossum olivaceum is similar, but features a bald stem and olive to brownish colors. Recent DNA studies (for example, Wang and collaborators, 2006) have consistently placed the genus Microglossum near Leotia, the genus that contains the well known, gelatinous-fleshed "jelly babies." Although this result has turned a few heads, the relationship was suggested by Fries (1821) nearly 200 years ago. Microglossum griseoviride is a similar, recently described, European species. 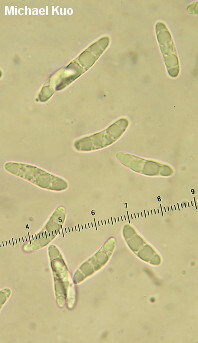 It features grayish green colors, thinner asci, and slightly smaller spores (measuring 16-20 x 4-5 µ). Ecology: Traditionally reported as saprobic; growing alone to gregariously in moss under hardwoods (and reported by others under conifers); summer and fall (and over winter in coastal California); reported in North America from California, the eastern United States, and the Midwest; not common. The illustrated and described collection is from Illinois. Fruiting Body: 15-45 mm high; consisting of a clearly defined, flattened head structure and a stem. Head: 6-26 mm high; 1-6 mm across; cylindric at first, becoming somewhat flattened and developing a central, longitudinal groove; bald; bright to dull green. 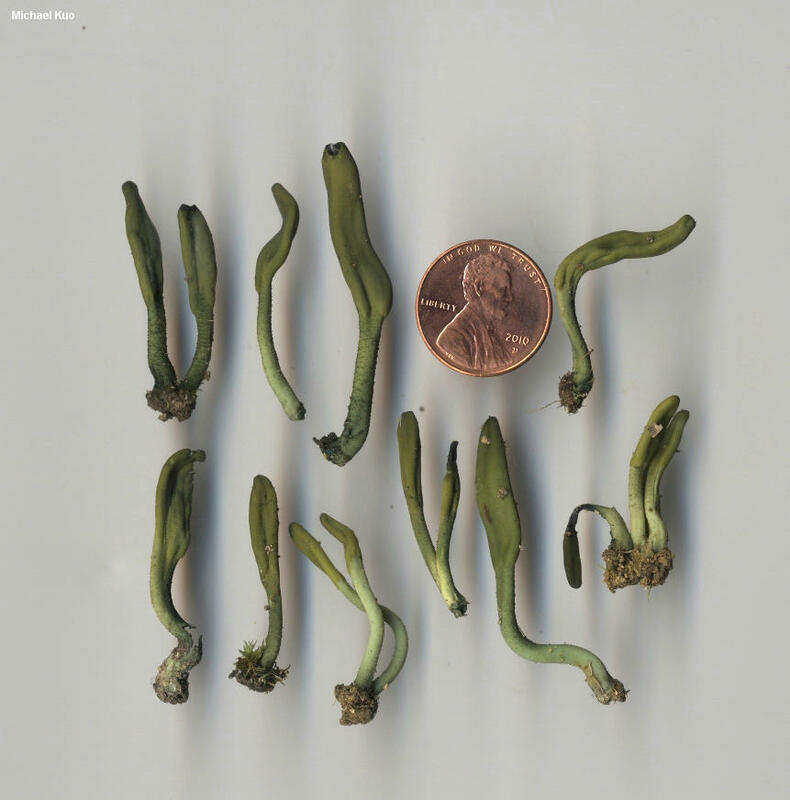 Stem: 9-21 mm long; 1-3 mm wide; cylindric; when fresh, pale pastel green and bald underneath darker green tufts and scales; sometimes becoming darker green and more or less bald in very old age. Flesh: Whitish to greenish; unchanging when sliced. Chemical Reactions: KOH negative on surface of head. Microscopic Features: Spores 17-22 x 4-5 µ; fusiform to suballantoid; smooth; slightly curved; 3-5-guttulate (appearing almost septate but with septa hard to define) and hyaline in KOH. Asci 8-spored; tips blue in Melzer's reagent. 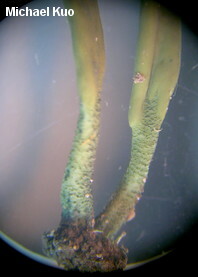 Paraphyses filiform; apices subclavate to nearly capitate; 1-2 µ wide; hyaline to greenish in KOH. REFERENCES: (Persoon, 1797) Gillet, 1879. (Fries, 1821; Saccardo, 1889; Mains, 1955; Smith, Smith & Weber, 1981; Breitenbach & Kränzlin, 1984; Arora, 1986; Wang et al., 2006; Kučera et al., 2014.) Herb. 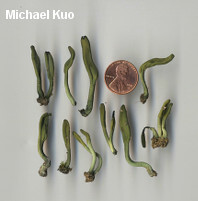 Kuo 06221301.